I wanted to get back into the Sol Duc to an area known as the High Divide. This backpacking trip would be done to track snow melt for future adventures. My friend Jay would join me for this hike. Have a upcoming trip into the Bailey Range. This scouting trip would give me a good idea what the Park interior looked like in the form of snowpack. This weekend warrior trip started a bit late on a Friday night. We did not get started up the trail until around a hour before sundown. 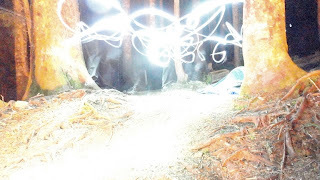 The next few hours were spent walking by headlamp. We made good time considering we were hiking at night. Because there was still a lot of snow in the high country, we made camp at 7 Mile Bridge Camp; so not to sleep on the snow. This was a bit smarter than headlamping in the dark over snow and trying to do route finding. We would get a fresh start on the day the next morning and continue toward our destination. After breakfast he next morning, we broke camp and headed up the trail to see how much snow was in the higher elevations. Hiking in these spring conditions is a bit dangerous, because of all the hidden snow bridges; that may cause injury when you rapidly punch through the hidden holes in the snow. The log bridge that was disabled during the winter months, was being repaired by a trail crew when we arrived. The crew had put a new massive log across the creek. When we arrived they had not yet finished setting the log into place. We got special permission to be one of the first hikers to use the bridge, it was our lucky day! Route finding up the trail was easy going, since it was a clear day and the trail was in part melted out almost all the way to Heart Lake. 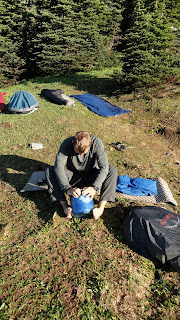 After hopping a few streams, we refilled water at Heart Lake itself. The lake was still partially snowed over from the winter before. After some ridge travel above the lake. We stopped and chatted with a ranger for a bit. After that conversation, we continued down the trail. We made camp in the early afternoon, then had lunch in the same meadow I was in the last time I was in the area. After ate lunch I took off solo to scout out as far as I could, within the daylight hours to explore Cat Basin. There was still a lot of spring snow in the area. I was unsure which direction I wanted to explore of the area, so I decided to climb up high on the ridge tops to get a view of the area. The slopes were steep to walk on without crampons, but I did have my ice axe to aid if I fell unintentionally. On the ridge tops I could see a stunning view of the surrounding Olympic Mountains, this included Haigs Lake, Mount Appleton, all the way down the Sol Duc Valley, Sol Duc Basin and Mount Olympus. It was breathtaking. Getting back to camp was a steep descent from atop the high ridge peak. At times all my limbs where used to travel down safely. I headed straight down toward the tarn that i seen before, because I knew the route back to camp was down around that same tarn. Shortly after I viewed 2 Marmots and a male Mountain Goat; which followed me back to camp. 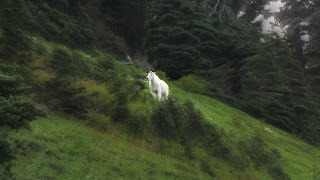 The goat did not approach us greater than a 100 yards, but looked massive at that distance. The next day after breakfast we broke camp and headed off the divide. Made really good time descending from the mountains; walking a super steady pace all the way down the Sol Duc Valley. Stopping a few times only for a few pictures and to chat with Rangers briefly. Overall it was a good trip. 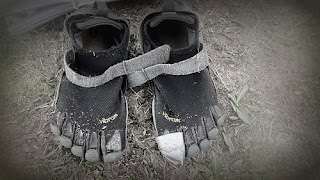 I got to test my Fivefingers on some mountain conditions, which include rock, snow and steep terrain. This was a good test for my feature for future adventures. I will continue to come back to the High Divide during the spring season. Its a perfect way to avoid the summer bugs and crowds; since this whole area is in a Park Quota Area.